With influencers like Dr Richard Smart pumping up Albarino, is it any wonder that so many Aussie producers got excited by the variety? Of course, that all blew up in the face of the early adopters, who in the noughties planted what they thought was Albarino and turned out to be I Can’t Believe It’s Not Albarino (but ia actually the awfully-close-to-Sauvignon Blanc French variety Savagnin Blanc). Since then, real Albarino has arrived in Australia (Andrew Margan picked his inaugural Hunter Albarino just recently) and the sting has come out of the Savalbarino debacle. Some producers, like the Yarra Valley’s Soumah, have pushed ahead with Savagnin regardless, choosing to celebrating its Italian heritage as much as the French side – given that Savagnin and Traminer and sharing plenty of DNA, with the village of Tramin near Bolzano its spiritual home ( I spent a few days in Bolzano last year. Another Traminer mutation Gewurztraminer seems to get much more attention in Südtirol/Alto Adige though). 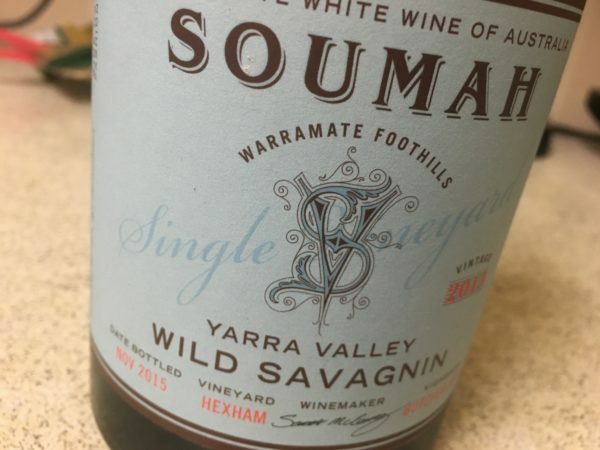 This year Soumah have three different Savagnin permutations available, with the Wild Savagnin one of the most successful Savagnin I’ve had in Australia – it’s really quite tasty, and proves the potential for the variety. Now for a Jura inspired style with early picked fruit and oxidative handling? Tank fermented Savagnin kept on lees. Savagnin also shares plenty of DNA with Verdelho, and there is something about the pear flavours here which make this more like a ripe cool climate Verdelho than something from the Jura (the high altitude French Savagnin home). Green straw, the grapefruit and just-ripe melon nose leads to a light to medium weight expression of fuzzy pear juice and quite tangy acidity. Ripe and yet almost saline, the biggest criticism is that’s not just a bit neutral – hard to pick variety here, though that’s probably not a strong suit anyway. Still, this is crisp, fruity white wine that is well made. Best drinking: 2016-2017. 16.5/20, 88/100 13.3%, $28. Would I buy it? I’d push up to the Wild Savagnin. Sourced from the Hexham vineyard, this is 5 tonnes of Savagnin made with full solids, wild ferment in barrel and 9 months in oak. Works a treat! Immediately this has more presence on the nose compared to the Savarro, the barrel ferment characters giving this a quite complementary edge of coconut shavings to go with the white flower and light pear varietal character. There’s more texture and weight on the palate too, with a fraction more phenolic grip compared to the standard wine. I like the texture, I like the intensity and I like the more complex mouthfeel, with yeast and barrel characters very complementary to the tart, vaguely floral Savagnin. More work, more fun. Nice wine. Best drinking: 2016-2019. 17.8/20, 92/100. 13.2%, $33. Would I buy it? I’d smash a bottle no probs. Al Fiori means ‘amongst the flowers’ and this clever blend sees Shiraz and Pinot Noir juice fermented in barrel, with a little Savagnin added after. It’s quite dark for a rosé really (more rosato), the colour light ruby with a little pink. It smells of ripe red berry fruit too, with plenty of Shiraz berry characters alongside redcurrant and raspberry. Just a little sweetness to fill out the palate, with some nice red fruit hints. It’s quite long really, a clever ‘full’ rose, if maybe a little sweet. Still, I liked it muchly – this has interest and style. Best drinking: 2016-2017. 17/20, 90/100. 13.5%, $26. Would I buy it? Two glass proposition.